BusyCal is an award-winning desktop calendar that combines personal productivity features for individuals with powerful calendar sharing capabilities for families and workgroups. 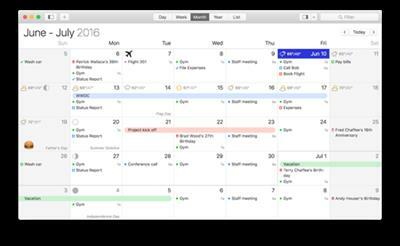 Respected long-time Mac developer, BusyMac today is proud to announce the much-anticipated release of BusyCal 3, a major upgrade to its best-in-class calendar app for (Mac OSX). And for the first time ever, BusyCal is now available for iOS, with the same power, flexibility, and reliability BusyCal for Mac users have enjoyed for years. BusyCal is a fast and powerful calendar app with innovative features and rock-solid support for syncing with iCloud, Google Calendar, and Exchange. The all-new BusyCal 3 has been completely redesigned leaving no pixel untouched. Every window, panel, font and user interface element has been redesigned with a more modern look that is visually stunning and a pleasure to use. BusyCal displays calendars in Day, Week, Month, Year and List views. What makes BusyCal unique is its ability to customize these views to more precisely meet the needs of the user. Users may choose the number of weeks displayed in month view or the number of days shown in week view. It's perfect for both long-range planning and focusing on the details when things get busy. And with the new smooth infinite scrolling in BusyCal 3, users can glide effortlessly from day to day or week to week with a swipe on a trackpad. Also new in BusyCal 3 is support for travel time, one of the most requested features. Travel time allows users to block out the necessary time to travel to an event location. Users can set a fixed amount of travel time or determine it automatically using the integrated support for Apple Maps and Location Services. Users can even receive alerts when it's time to leave as traffic conditions change. The menu bar app in BusyCal 3 also received a makeover. It now displays a navigable mini-month calendar with colored dots and bars that provide a visual density map of the user's availability. A scrolling list of events is displayed in the menu along with a 10-day weather forecast. Users may click on an event in the menu bar to view its details, and create new events and to dos using natural language. And the menu bar app runs independently from the desktop app, so users always have access to their schedule. One of BusyCal's most popular features is its support for to dos that are integrated into the calendar, display on the date they are due, and carry forward until completed. In BusyCal 3 support has been added for Timed To Dos that occur at a specific time of day and appear inline with calendar events. It's great for managing both calendar events and tasks in one app. And BusyCal to dos are compatible and sync with the Reminders app on Mac and iOS. And for the first time ever, BusyCal is now available for iOS, offering the same power, flexibility, and reliability BusyCal for Mac users have enjoyed for years, including customizable views, integrated to dos, travel time, live weather forecasts, and more. And like its desktop counterpart, BusyCal for iOS is compatible with iCloud, Google Calendar, Exchange, and other leading calendar services. In addition to the above, BusyCal 3 provides a long list of other innovative features including a redesigned embedded Info Panel for quickly viewing and editing events, Smart Filters for creating calendar sets and saved searches, enhanced searching and filtering capabilities, BusyContacts integration for linking events with contacts, improved event creation via natural language input, event categorization via tags, live weather feeds and moon phases, custom font sizes and styles, graphics, and more. * View and edit event details in a non-modal info panel. * Create repeating To Dos that display in the calendar and carry-forward until completed. * Scrolling Month and Week Views. * Customizable list view lets you filter and sort events by date, calendar, and more. * View live weather forecasts, sunrise/sunset times, and moon phases right in your calendar. * Customizable event fonts, sizes, styles and colors. * Add graphics to your calendar. * Add virtual sticky notes to your calendar. * Sync with the iPad, iPhone, and iPod Touch via MobileMe, Google Calendar, or iTunes. * Sync with MobileMe Calendar and other computers/devices that sync with MobileMe. * Sync with Google Calendar and other computers/devices that sync with Google Calendar. * Sync with other BusyCal users on a local area network or over the internet. * Share calendars with others, with password-protection and SSL encryption.